Christoph Graupner was an almost exact contemporary of Johann Sebastian Bach. Indeed, along with Telemann and a handful of others, Graupner was regarded more highly than was Bach during their lifetimes. This CD may go some way to explaining why. These three Suites are compact, colourful, poised, pointed and intriguing. Although lacking the gravity of most of Bach's output, their early Galant style emphasises forward movement and accessible melodies. Add to this instrumental brilliance, particularly in the way sound profiles are built up and explored. All these factors serve easily to delight the ear and have much to offer. The musicians gently offer us the benefit of their understanding of Graupner's enormous output. He wrote ten operas, a hundred symphonies and a thousand cantatas. Along with Telemann Graupner was one of the leaders in the musical revolution in Leipzig which overtook Bach's predecessor as ThomasKantor, Johann Kuhnau. Graupner was considered for the post in Leipzig and deemed more suitable than Bach yet turned it down and worked for over fiftyy years at one court - Darmstadt. It's with a dignified detachment - yet every technical competence - that Kaakinen-Pilch presents this music. Neither Graupner nor his music needs to 'shout'. These musicians seem to be implicitly suggesting that Graupner's 85 suites and 44 concertos need as little fuss made about them as would the equivalent works from Haydn. This CD certainly demonstrates that Graupner possesses more than his fair share of originality, ingenuity and freshness. 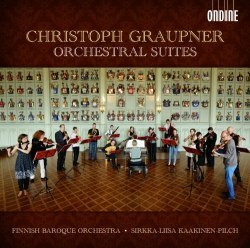 This must in part be due to the fact that the dozen plus members of the Finnish Baroque Orchestra understand Graupner's gifts for melody and harmony very well. To listen to but a few bars of any of the dozen and a half movements from these three enticing suites is to hear tuneful invention and fascinating counter-position. Graupner's pleasing originality is to be heard at various levels. His rhythms are part of the attraction. Just listen to those dotted crotchets redolent of Lully in the GWV 450's third Air [tr.5]. His instrumental palette is well stocked: try the combination of pizzicato and arco strings with winds in the (Largo movement of the) G Major Suite [tr. 11]. Then there’s the extraordinary combination of winds alone in the second F Major's Overture [tr.13]. At the same time, these three suites display a nice preoccupation of Graupner's - that of a liking for unusual or specially colourful instruments … here the chalumeau, bassoon, transverse flute and Baroque horn. This requires aptitude on the part of the players and there's plenty of it but again without ostentation. It’s just as Haydn or Mozart might have admired. The two works in F Major are already available: GWV 450 on Berlin Classics (16712) with Bell'Arte Salzburg under Annegret Siedel; GWV 451 on MD&G (Musikproduktion Dabringhaus und Grimm) Gold (3411252) with Nova Stravaganza under Siegbert Rampe. The present recording is well up to those standards. The acoustic is present, close even; yet it enhances the tones and particular strengths of the soloists. The liner-notes set out some background - Graupner is not the best known of composers. There are also welcome brief sketches about the soloists from the Finnish Baroque Orchestra whose only recording currently in the catalogue this appears to be.